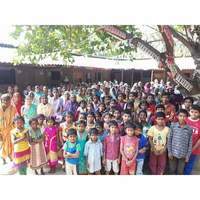 Grace Children Ministries is a Christian non –profit organization dedicated to being a channel of Yeshua’s (Christ's) love for the poor, the widow, and the orphan; showing in a practical way the love and compassion of GOD to the less privileged. GCM is committed to caring for orphans and widows by meeting both physical and spiritual needs as well as proclaiming the good news as they seek to fulfill the call of God. We are reaching the unreached with the good news of the kingdom of heaven.